Children are exceptional in their ability to learn language. From the day they are born, their little minds begin analyzing the language they hear their caregivers speaking and begin the work of reconstructing that language piece by piece in their own brains. By age four, most children have advanced language skills: they sound like native speakers of their language, they know over 1000 words, and their sentences are just as grammatically complex as their parents’ sentences. However, not all children develop strong language skills early in life, often because they have poorer language environments. This can have negative consequences for later literacy skills, social-emotional development as well as other cognitive skills. Therefore, it is exceedingly important that all children grow up in language-rich environments, in which caregivers afford children frequent opportunities to learn and practice language. 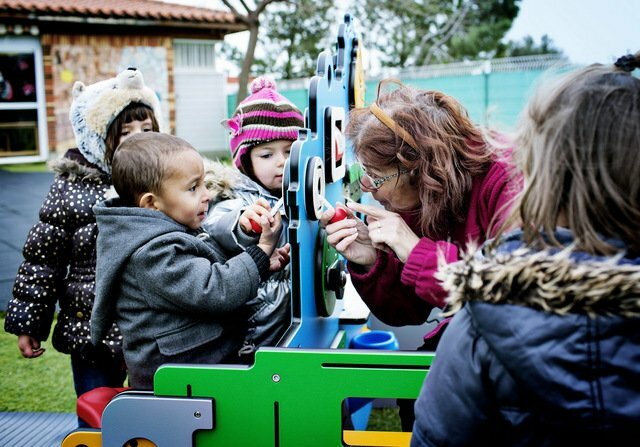 Play supports language development – especially when the adults play along. Play appears to be an incubator of language skills in a number of ways. When children play, they learn to think symbolically, such as when they pretend that an object (e.g. a banana) is something that it is not (such as a telephone). Symbolic thinking is also an essential aspect of language. Words are symbols, and language is basically a system of putting these symbols together into longer chains. Besides symbolic thinking, play also affords children many opportunities to practice language. When children play together, things like negotiation, giving instructions and exchanging information are required in order to build up a fun experience. Dramatic play in particular requires children to act out scenarios that require specialized vocabularies (such as playing pirates or playing doctor). Finally, adult-participation during child-led play exposes children to high quality language input. Adults possess vast vocabularies and sophisticated narrative skills. When they involve themselves in children’s play – without directing it – children’s language skills develop even more. 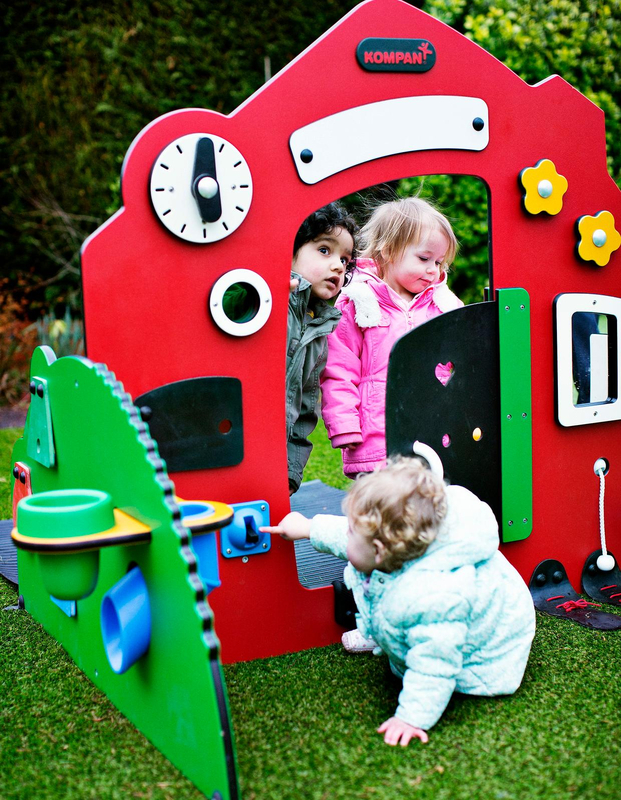 Very little research exists regarding children’s language development in the context of playground play. To address this shortfall in scientific knowledge, the KOMPAN Play Institute has chosen language as a focus area for its own in-house research. 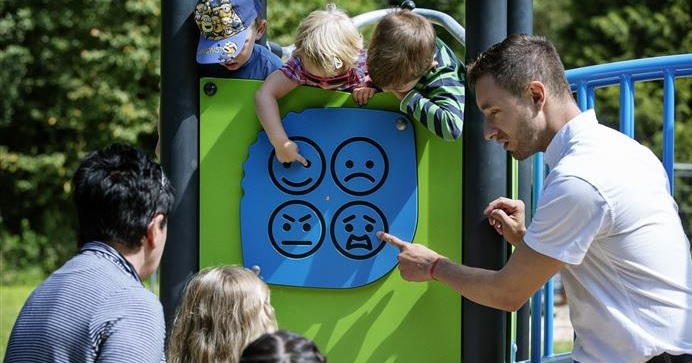 In its most recent study, research manager, Dr. Justin Markussen-Brown found preliminary evidence that three-year-olds use more language when playing on a play structure compared to the adjacent grassy area. To learn more about these findings, download the associated white paper.